As the United States army entered World War II, it drew certain conclusions from Germany’s quick victories over Poland and France. One was that a highly mobile tank destroyer force needed to be held in reserve to deal with sudden Panzer breakthroughs as they occurred, rather than keep anti-tank forces at the front. Therefore, anti-tank elements were removed from infantry divisions to form independent battalions, which were initially equipped with a number of improvised mobile tank destroyers, the M3 half-track mounting a 75 mm (2.95 in) gun, and the GMC M6, a truck with a 37 mm (1.46 in) gun. 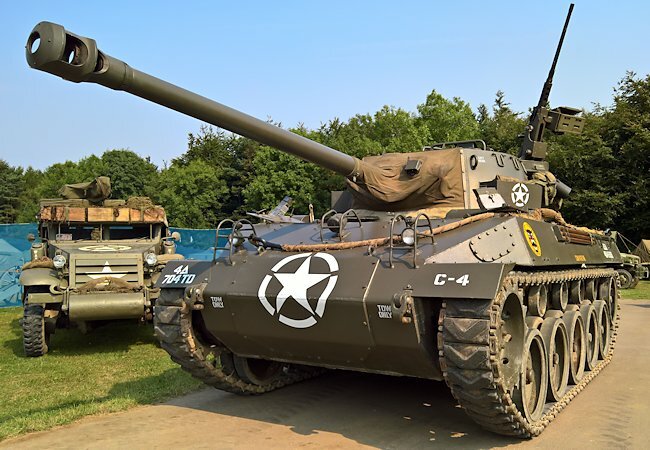 Restored M18 GMC Hellcat tank destroyer at the Military Odyssey event in southern England. Once Operation Torch provided battlefield experience for the army to evaluate, it became apparent that more powerful tank destroyers would be needed. First of the more powerful weapons was the M10, built on the chassis of an M4 armed with a 76.2 mm (3 in) gun. However, the M10 was still insufficient, so an order went out for a tank destroyer designed from the ground up to hunt and destroy tanks. This vehicle would become the M18 Hellcat. In December 1941, the Ordnance Corps issued a requirement for a fast tank destroyer using torsion bar suspension, a Wright/Continental R-975 engine, and a 37 mm (1.46 in) gun. This became the T42 37 mm (1.46 in) Gun Motor Carriage. The army then changed their request to a vehicle mounting a 57 mm (2.24 in) gun, thus the designation changed to the T49 57 mm Gun Motor Carriage. Yet another change, requesting a 75 mm (2.95 in) gun, led to the T67 Gun Motor Carriage, of which one was built from a T49 chassis. 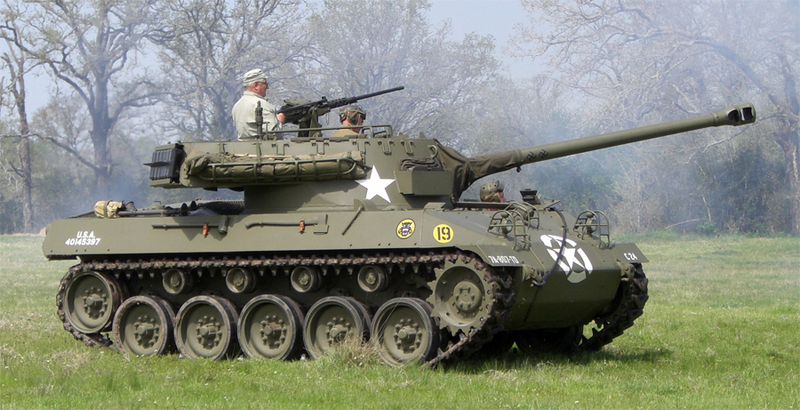 Finally, the T70 76 mm Gun Motor Carriage emerged and would become the M18 Hellcat. It was designed by Harley Earl at Buick. Tests on an oval track, as well as a specially designed bumpy track, demonstrated that the lightly armored vehicle could achieve high speeds. Production of the M18 started on January 7th, 1943, when 1,000 units were ordered. Speed and agility were the hallmarks of this particular tank destroyer; these qualities came about from using a powerful engine and by keeping armored protection to a minimum. As was the case with other tank destroyers used by the United States, the M18 had an open turret, which left the crew vulnerable to snipers, grenades, and shrapnel. Rarely was the high speed of the Hellcat fully used in combat, but the ability to outflank German tanks, for side and rear shots, did benefit the crews against the heavily armored Panther and Tiger tanks. Ease of maintenance came from the engine being mounted on steel rollers, which permitted quick removal and replacement. The transmission was also easily accessed in this manner. The 76 mm (3 in) gun soon proved to be not as effective as hoped against German armor, although a limited supply of high-velocity armor piercing ammunition did compensate to some extent. The crew comprised five members, the commander in the turret left rear, gunner in the turret left front, loader in the turret right, driver in the left front, and assistant driver in the hull right front. The armor consisted of rolled and cast homogeneous steel, as follows: Gun shield .75 inch (1.9 cm) from 0-60 degrees; Front (cast) 1 inch (2.5 cm) 23 degrees; Sides .5 inch (1.3 cm) 20 degrees; Rear .5 inch (1.3 cm) 9 degrees; Top (none); and floor 0.25 in (6 mm). The main armament was a 76 mm (3 in) M1A1, M1A1C or M1A2 gun with 45 rounds. It had a 360-degree manual and hydraulic traverse at 24 degrees/second, +20 degrees to -10 degrees of elevation/depression. The secondary armament comprised a .50 (12.7 in) caliber M2HB machine gun in a ring mount (800 rounds), rotating 360 degrees, with manual traverse. In July of 1943, the Hellcat went into production at the Buick plant in Flint Michigan. Although Buick was contracted to build 8,986 Hellcats for the US army and Lend-Lease recipients, only a total of 2,507 vehicles were produced, with production ceasing in October 1944. There were a number of variants tested using the chassis of the Hellcat. The T86 and T86E1 amphibious tank destroyers, as well as the T87 105 mm (4.13 in) amphibious Howitzer Motor Carriage, the T88 105 mm (4.13 in) Howitzer Motor Carriage and the Super Hellcat mounting the turret from the M36 turret were all tested, but none proceeded to production before war’s end. The only variant of the M18 to see production and combat was the T41/M39 armored utility vehicle, used as a turretless personnel or cargo carrier and as a gun tractor. M39s saw service in both World War II and Korea, before being declared obsolete on February 14th, 1957. A prototype of the M39 was tried as a flame thrower tank, the T65. It did not go into production. Although some Hellcats went to China to fight the Japanese army, they were primarily used in support of infantry, as Japanese armor was scarce and of poor quality. Two battalions of tank destroyers did see service in the invasion of the Philippines using Hellcats. Starting with Anzio in Italy, M18s saw action in Italy and Northwest Europe. The following tank battalions used the M18 during part or all of their service: 602nd battalion 9\1944, 603rd 8\1944, 609th 9\1944, 612th 1\1945, 637th 1\1945 (Pacific), 638th 11\1944, 643rd 2-3\1945, 648th 5\1945?, 656th 2\1945, 661st 2\1945, 704th 7\1944, 705th 7\1944, 801st 4\1945, 805th 6\1944, 807th 4\1945, 809th 2\1945-4\1945, 811th 11\1944, 817th 4\1945, 820th 4\1945, 822nd 4\1945, 824th 3\1945, 827th 12\1944. Note: The dates are for when the unit received the Hellcat. According to the army’s “Seek, Strike, Destroy” doctrine, these battalions were to be kept under the control of upper echelon headquarters, in order to respond quickly to mass Panzer attacks. However, since the Germans almost never employed their tanks in this manner, the battalions ended up parceled out to infantry divisions, where they provided direct fire support, blasting pill boxes and other fortifications, or in indirect fire roles interdicting German movement. Not designed for these roles, the M18 nevertheless did excellent work supplementing the artillery of these infantry divisions. Throughout the long campaign in Italy, then through France and the Low Countries, the tank destroyer units had a number of moments to shine as tank destroyers; at Arracourt, in France, on September 19th 1944, the 704th TD battalion in support of the 4th Armored Division destroyed 15 tanks of the German 113th Panzer brigade while in a dense fog; during the Ardennes offensive on December 19th-20th 1944, 4 Hellcats of the 705th TD battalion supported an attack on the 2nd Panzer division. This spoiling attack slowed down the German attempt to seize Bastogne until the Americans could organize their defenses. In addition to serving with the United States army, the Hellcat also served with the armies of Taiwan, West Germany, and Yugoslavia (until the 1990’s). Camouflaged Hellcat at Anzio, May 1944. The camouflage scheme is deduced from a picture from the front. Notice the early gun without muzzle break. M18 Hellcat in Italy, 1944. M18 “Amazin Grace” from an unknown US Army unit in France, 1944. 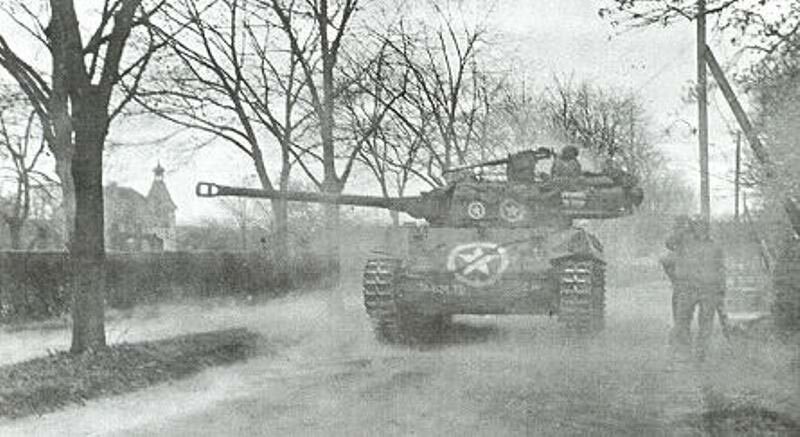 Hellcat from the 805th Tank Destroyer Battalion in Italy, 1944. M18 Hellcat, Battle of the Bulge, winter 1944-45. 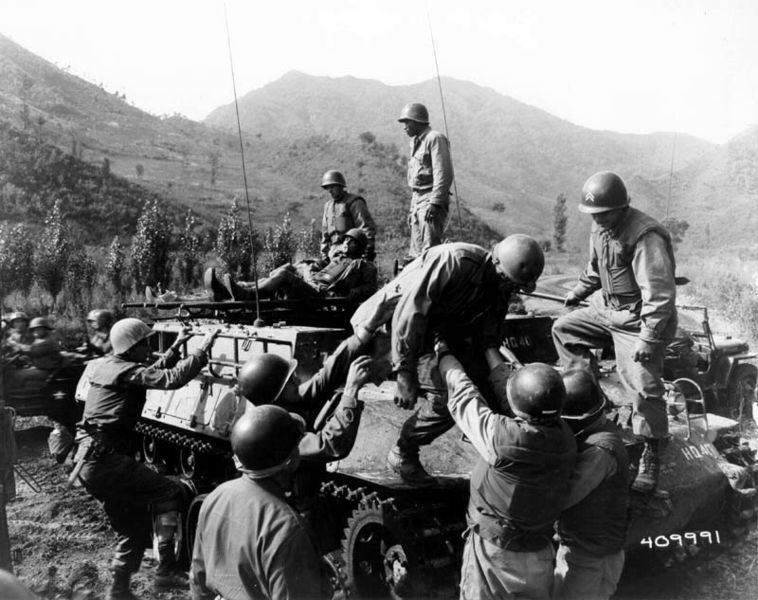 M39 Carrier in Korea, 1952. Hellcat from the 249 MAC Division, Republic of China, 1980s. Bosnian Serb M18 Hellcat in 1995. Hello love this site. Here’s my question, what was the most popular/most used tank destroyer among the Allied armies? Why would they design an open turret. With the light armor protecting the hull of the tank, they could’ve, should’ve encased the turret. I understand the field of view is better with an open turret. The Abrams could’ve used the help. I meant to say the Abrams could’ve used the help. The Abrams doesn’t need any help! Dammit! I’ll try again the SHERMAN could use help. Agreed, it makes no sense to design an open turret. That means any enemy soldier that has the high ground and a decent gun could take out the crew. Open topped turrets in general not only provide a better view for the crew, but also have less weight. With the Hellcat, this was important because of the design on the tank; it was designed to go at high speeds to outflank it’s opponents. While it’s just a hunch of mine, I also believe that open-top turrets are easier to make and cost a little less. Some open-top turrets did get upgraded to have a proper turret covering. Crews for open-topped vehicles would sometimes stretch canvas over the turret/hull, and the M36 Jackson got a steel turret roof after WW2. It’s in the works, but a release date is not set what so ever. Er, guys? It’s a tank destroyer. But do yourselves a favor: FLOOR IT!!!!!!!!! FIFTY MILES AN HOUR, BABY!!!!!! could you make a Avenging Angel M18? Yeah, how does the hellcat go that fast, it would have gone as fast as modern tanks? The M18 is a comparatively light vehicle, it only weighs about 17-18 tons but still has about a 400 horsepower engine, compared to an M4 medium which weighs about 30-33 tons with the same engine. how much money did it take to make the tank and how much would it sell for today.